A rookie officer in Tukwila, WA, helped apprehend a dog thief this weekend! 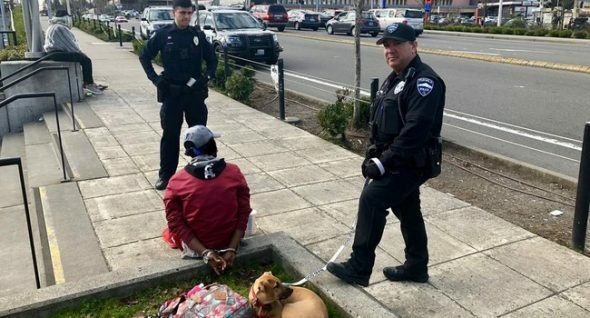 A stolen dog is back with his joyful owner in the city of Tukwila, WA, after an alert, rookie cop spotted both dog and suspect out on a walk. Back on March 13, the dog’s owner called police after her dog was stolen from outside a restaurant. She said the male suspect walked past her dog twice, then grabbed, unleashed and ran off with it on the third pass-by. While the suspect remained at large, police said she gave a very good description and provided them with photos of her dog. Days later, Officer Schneider, the handling officer for the original call (who the Tukwila Blog described as “fresh out of the academy”) saw the suspect — who appeared to be wearing almost exactly what he had on the day he took the dog — walking a dog that looked like the victim’s. Animal control was called to the scene to check the dog’s microchip, which verified that the dog belonged to the victim. She was called to the scene and ID’d both her dog and the suspect, who was later booked for theft.